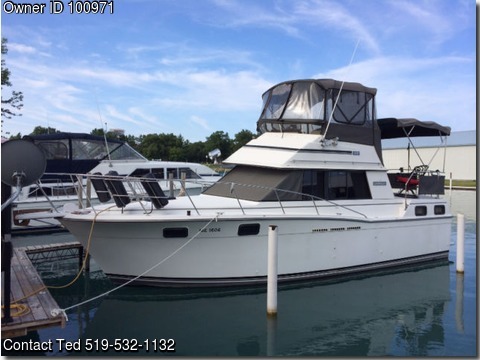 Boat is located in Port Lambton,Ontario,CA..Please contact the owner @ 519-532-1132 or theodoregervais2@gmail.com...Very clean overall condition, approx. 825 hrs on strong running twin 350 Mercs. with velvet drive trans. Two private staterooms, aft cabin has its own ensuite, main salon head includes full shower, 2 new raritan heads. New corian counters in galley nicely accent the white leather salon set. Survey completed August, 2015 with very good overall rating. Core samples were also taken and all were dry. A highly manouverable and stable boat. Spacious and comfortable for extended cruising or overnights. Recently replaced items include swim platform, bow pulpit, 4 batteries, bimini, power winch, chart plotter, flybridge screens. Salon doorway teak has been refinished spring 2015. Can be seen at heated storage facility in Port Lambton where it is being kept for the winter.$25,900 CA.